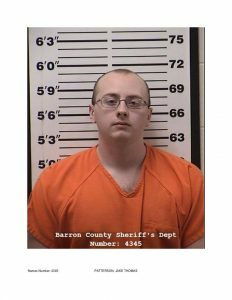 Barron County officials named a Gordon, Wisconson man as the primary suspect in the abduction of 13-year-old Jayme Closs and the murder of her parents. Jake Thomas Patterson, age 21, is being held in jail on charges of 1st-degree homicide and abduction. Barron County Sheriff Chris Fitzgerald said that Patterson took steps to avoid detection from law enforcement and from friends and neighbors. Patterson was not familiar to local law enforcement, nor does he have any criminal history in the state of Wisconsin, the Sheriff said. Closs was discovered yesterday afternoon in a remote area near the town of Gordon, Wisconsin when she approached a woman who was out walking her dog. Sheriff Fitzgerald said it doesn’t appear that the suspect had any contact with Jayme’s family prior to her abduction. The sheriff said it appeared that Jayme was Patterson’s target, and that he likely killed her parents in order to take her.